Ruffino sat behind his captain’s wheel. He had spent most of his days over the past six months sitting in the same spot. His vessel once full of skip jack and yellow fin tuna had begun its journey from his home port of General Santos in the Philippines and then continued to Indonesia, before he took a risky move cutting back through the high seas and into waters of Palau’s marine sanctuary on the way to his home port. That was a long time ago - at least six moons had passed. Now, in June 2016, he was sitting under house arrest aboard his stationary vessel. His bounty of fish was gone. His wife, his family, were on his mind. They would be worried about his health, unsure of his return. His eyes swelled with tears for his loved ones and his face was twisted with an expression full of a fear, as he knew he was in a lot of trouble. In June 2017, we found Captain Ruffino sitting under house arrest at his ship's wheel in Palau. He could just get up and flee. There were no bars keeping him trapped on the fishing vessel, yet he sat there patiently leaning on his captain’s wheel waiting for his punishment to end. The head of the marine sanctuary, Keobel Sakuma, was standing beside him, asking him questions about why he broke the law. Why would such a gentle, patient soul do such a thing? The park rangers slashed for hours on end through overgrown vines and palm leaves. One ranger led the way with a machete and each had a rifle or revolver hitched to their side. They walked briskly and purposefully. Lunch today would consist of peanuts, as it would on the next day. There are just some memories you will never forget. In 2012, we followed park rangers into the Corcovado jungle to the search for poachers. Our sweat-drenched clothes, the mud, our moist toes, the ruthless biting-bugs; these are memories that will remain vividly in my mind. Co-Director James Sherwood and I trekked for days through the jungle of Costa Rica’s Corcovado National Park in 2012 filming a documentary about the struggle between the idea of protecting places, and keeping them pristine, and that of human encroachment. We were on the chase for poachers. It was also a chase that turned into a joint mission for a time with police, who were on the hunt for cocaine traffickers on the run - the culprits had fled deep into the soul of the jungle’s dark interior. Despite the spooky feeling that comes with not knowing where danger lies ahead, and whether the jungle has eyes, we kept going under the cloak of darkness. 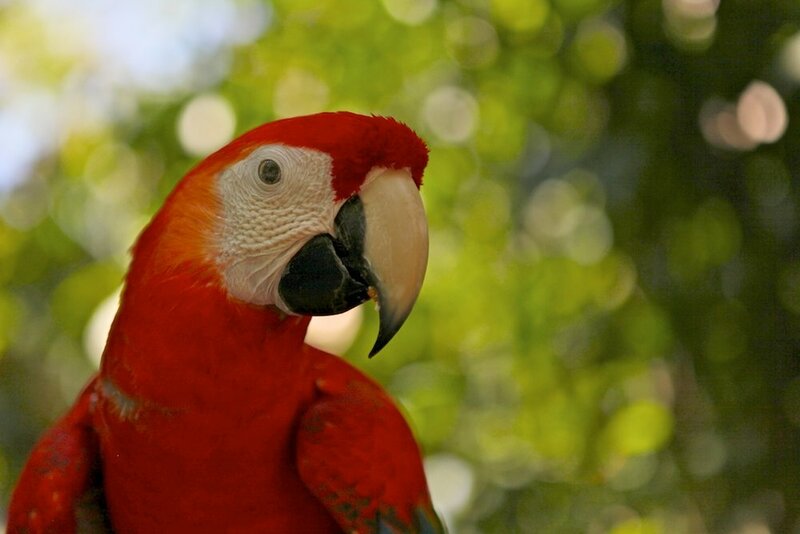 A macaw rescued from the pet trade. Osa Wildlife Sanctuary cares for many rescued animals. We visited the house of a conservationist, which bordered the national park. Not long before our visit she was brutally murdered by suspected poachers after standing up against their perceived right to use her entryway as a pathway into the interior of the park. Our truck would shudder and break down that same night, sadly on James’s birthday. He slept curled around a tyre. I nestled into the backseat. The night engulfed our little troop with all sorts of strange and eerie sounds; this was a remote area of Latin America where the tensions between the local hunters and poachers ran high. Out in this wild place, we just had to hope that the vast starry sky was wide enough to keep our foes miles apart from where we awkwardly slept around our crippled truck. Corcovado National Park at dusk. Our truck broke down in the dead of night. The next day, we waited for help. A rescued spider monkey from the pet trade. A broken-down vehicle was normal in the Corcovado. The trucks were old. The rangers did not complain; they just nodded off, still dressed in their daytime clothes. On the smell of an oily rag of a government budget, the rangers spent weeks away from their families, guarding one of the last bio-diverse wildernesses on the planet, constantly alert - and privately concerned for their personal safety - while the hunters stealthily set up camps, so they had time to catch wildlife. A rescued ocelot from the pet trade. The poachers preyed on the wilderness sometimes out of pure necessity for self-subsistence to feed themselves and their families, while some did it just for the pure adrenaline rush, and others did it to make money by trading live animals on the pet market. The black market of the wildlife trade was something I had researched with fascination during my international relations degree. Plus, my parents often talked during dinner about the complex, fragile connection between humans and nature. So these issues were by no means a surprise to me - theoretically-speaking. Corcovado park ranger Mauricio Jimenez at dawn, 2012. (See the link to the full story. 'Corcovado's Dark Secret', further below. Living briefly in the moment of the life of a ranger changed my world: I realised, if I were to live another life, I would become a park ranger. I would live and toil under the stars. Despite the perils of jungle-living and James’s eventual onset of a nauseating fever, I came out of that experience seeing how critical the rangers' role is for the entire planet: without the rangers, there would be no wildlife left. Animals would be free for the taking. The Costa Rican park rangers slash through jungle, 2012. So when we met with Keobel Sakuma, the head of Palau’s national sanctuary, I was able to empathise with the plight he endured when it came to working with tight budgets, brutal conditions on the front line, and the dangers that loomed for each of his rangers every time they went out to sea. His team was burdened with the mammoth task of patrolling more than 620,000 square kilometres of the Palau exclusive economic zone in the middle of the Pacific Ocean with very few boats. Keobel took us on a tour of a former navy vessel donated by the Australian Government. The ship was grey and grand in stature, dwarfing everything else around it. The locals knew they were fortunate to have the support too of Japan and the USA, but ultimately I could see why Keobel might question whether all this help might be equal to the task of patrolling hundreds of thousands of kilometres of blue wilderness. I remember thinking back to our expedition in Costa Rica; musing over how small I felt in the jungle as we slashed our way through overgrown pathways and how easy it might be to hide behind the impenetrable green wall, if you had the courage to keep your nerves quiet. Operating an enforcement patrol over such a vast wilderness means enforcement personnel like Keobel essentially must search for needles in a haystack, despite the mass of technology being tested and deployed in his nation. Wit, physical strength and intuition would always be at the core of an enforcement agency's daily duties. These were imperative skills. The other thing we also understood about the challenges Keobel faced was that he was dealing with the desperate vulnerability of human lives. The Filipino fishing crew under house arrest, living on a seized vessel in Palau, June 2017. The illegal fishermen the rangers capture might come from a place of hardship (a world which has no regard for the rules of a marine sanctuary). This means that this fight to protect wild places is not just about the good guys and the bad guys, said Keobel in his interview. This makes Keobel’s job very hard. He is forced to sometimes turn a blind eye to the tears of those he captures like Ruffino. Keobel’s own survival depends on keeping his country’s fish stocks healthy and Captain Ruffino had sailed through Palau waters ignoring his country’s law, which bans vessels from even holding and transporting a catch of fish throughout Palau's territorial waters. Keobel had no choice but to keep the Captain confined on his ship. The Rock Islands of Palau. Meanwhile, in Ruffino’s eyes, he was just doing what his boss told him to do. He had no choice. Ruffino comes from an island country, which has depleted so much of its fish stocks that their boats are creeping out into the waters of other nations, trying to collect as much fish as they can. (While I would never endorse breaking the rules of any protected area, I could find compassionate grounds for excusing Ruffino personally, for knowing nothing else and believing he has no other option but to do his boss's bidding). Fortunately, for Ruffino, his plight would soon end. He would be repatriated home once the owner paid the fine, but the trouble was that he had been waiting for six months for the owner to do it. Six whole gruelling months without his family, sitting behind the wheel of an idle vessel that wasn’t his, while his boss was free to live his normal life. The sensitivities and emotions involved in this topic make it extremely difficult not to be emotionally affected by the grief of one captain and an entire nation. It was difficult to look directly into the eyes of both Keobel and Ruffino, who are equally fighting for their own survival. What you do see at the heart of the matter is that this is most certainly not just an environmental issue. It is a pressing human rights issue - one that is often overlooked, because the wild ocean is out of sight and easily out of mind when people go to a supermarket and buy a cheap tin of fish. Whether it is the physical abuse and enslavement of Thai fishermen by their owners (as recently reported by Human Rights Watch), or the boat owner’s neglect of Ruffino and his wellbeing, this is a situation that most people are ignorant of when they purchase a tuna steak for tea or pet food for their beloved dog or cat. After knowing this, we can no longer just tuck comfortably into our dinner without fully appreciating the fish’s story - the human plight that is intertwined with its fate. The complexities of our human connection to nature as fish stocks dwindle worldwide require both compassion and creativity - they require a deep tug at the human soul and a change of attitude and behaviour, whether it is in the way we catch fish, or the way we select one to eat. While I was already aware of these issues when I first met Ruffino, meeting him had a profound impact on me. I don’t think that I could ever eat tuna again without seeing Ruffino’s face. He wasn’t just any boat captain; he was a symbol of the sea’s distress. (To see one solution to Captain Ruffino’s problem, read the story of Mario, a Filipino fisherman who helped to restore the fish-life around his island home in ‘The Legend of Apo’. Or, seek out your local sustainable seafood guide and buy MSC or ASC products next time you buy seafood).